What better way to celebrate summer than a garden party: music, cocktails, food and dancing. It does not have to be more. Garden party? Beach or pool party? Or simply, on your balcony? A few important ingredients to make sure you will have a stress-free event. Make a list of things to do, things to buy during the week and what to purchase in the morning of the day itself. How many people you will invite. The type of food you want to serve, or is it just for drinks. Dancing or lounging? Day time or evening? And don't forget to invite people in time. Define your palette, go for colour, knowing that the '70s glam look is trendy: develop a distinctive mix of bright colours, bold patterns, and prints. Your outdoor sofa and chairs need new upholstery? This is the perfect moment to give it a new look. 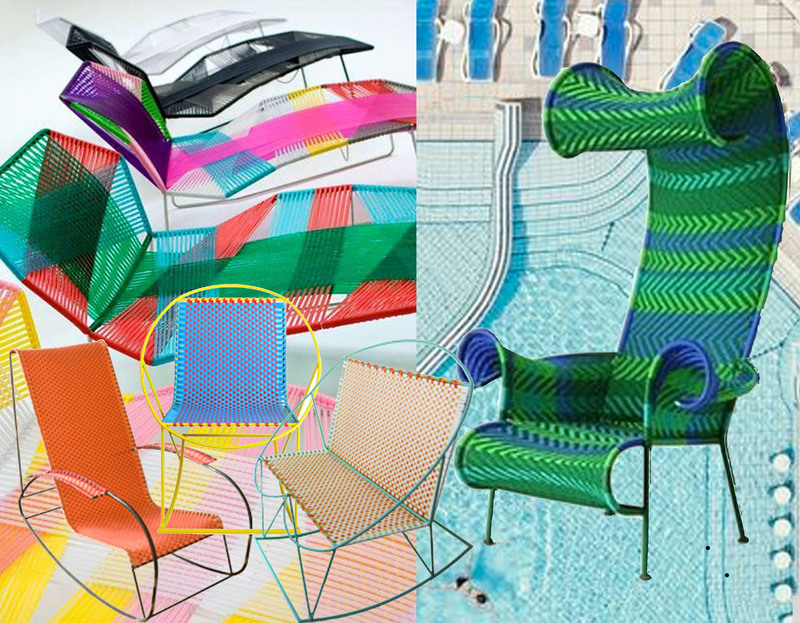 Use colour, combine patterns, they will give sparkle to your outdoor lounge area. Combine graphical motifs with stripes, and why not add flowers. Use bi-coloured fabrics: a bright colour combined with white to give it a fresh look. The temperatures will go up: keep drinks and food tasty and refreshing. Maybe you don't want to get your beautiful dinnerware out, there are a lot of option. 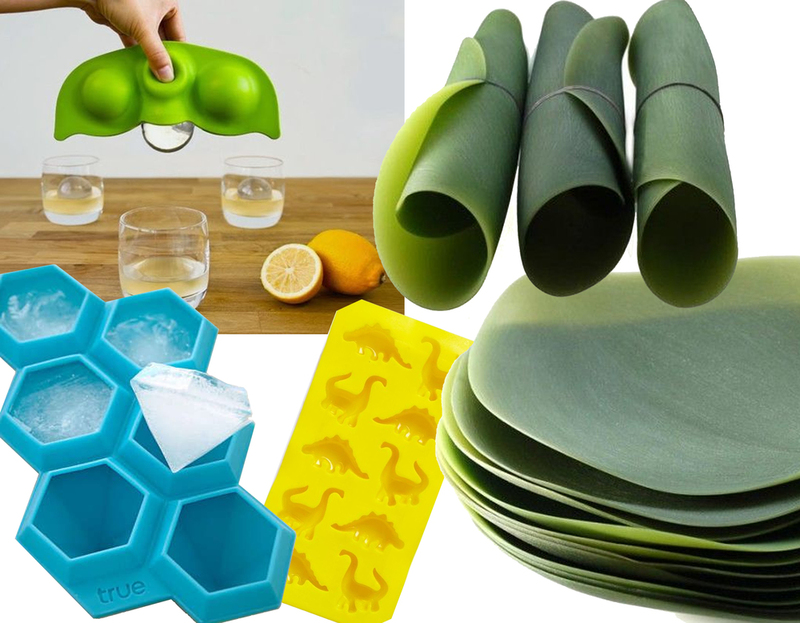 Some green silicone plates in the shape of a leaf will give an exotic look to your food. Maybe you want to keep it easy and go for paper plates, think twice as you will drop them afterwards in the waist bin, think ecological. Keep your drinks cool with some special shaped ice cubes. You can always simply fill an ice cube tray with water, and make it special by dropping in some red forest fruits, slices of lemon and oranges. Once frozen, the infused cubes are perfect for adding flavour and cooling down a glas of water or fresh-squeezed lemonade. 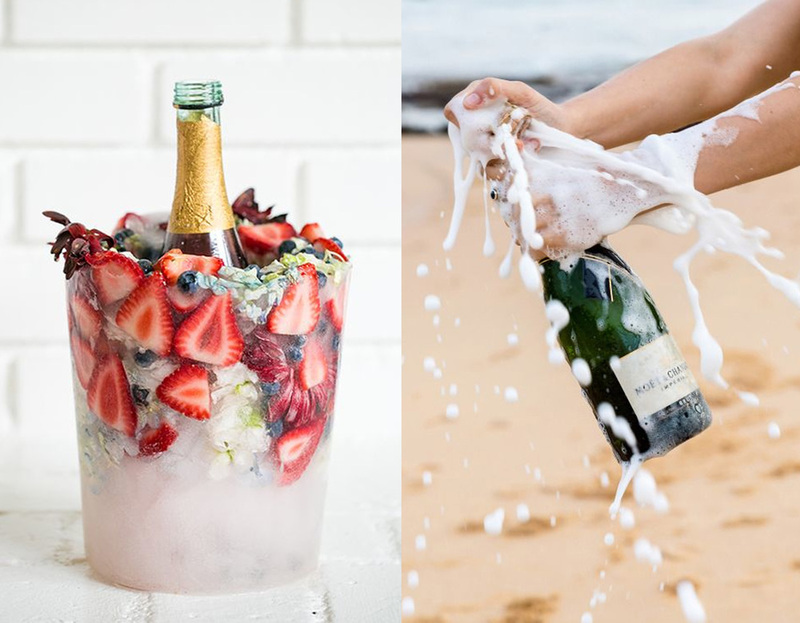 Or you can go very design and create a beautiful ice bucket decorated with flowers or fruits. An outdoor rug will help you define your outdoor space and will soften the stone floor. By adding some floor pillows you are creating the perfect space for a stylish picnic in the back garden. The sun gives you crazy ideas: take your rug out of the living room, put it on top of the car and drive to the country side for an amazing lazy picnic. You can decorate your outdoor space as you decorate your living room: there are special rugs, fabrics are treated for different types of weather and there are even outdoor chandeliers. Keep the menu easy, you don't want to cook the whole day with these temperatures. Infused waters are refreshing and add colour to your table. Finger food is a great idea as it is care free, you can prepare all before and enjoy the party together with your guests. Don't forget the napkins. 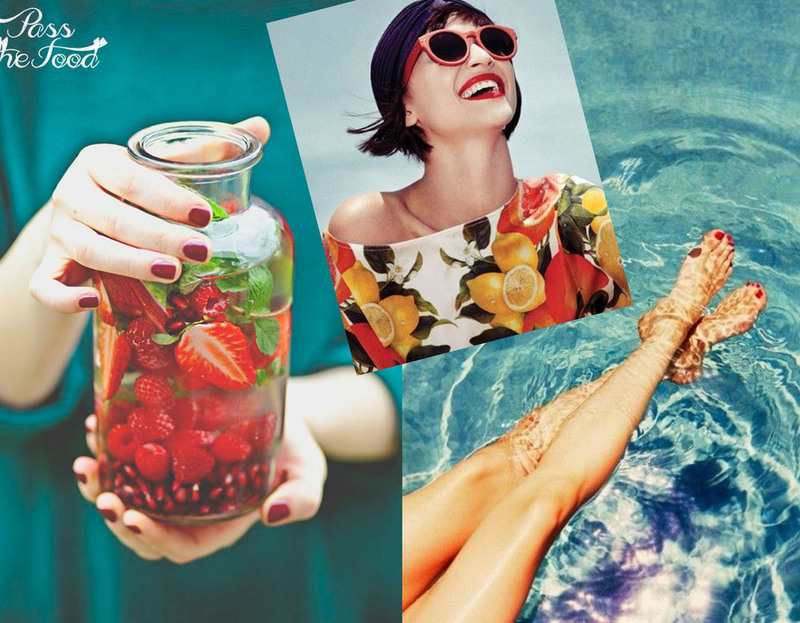 Summer is all about being outside, enjoying the sun and creating memories with family and friends. 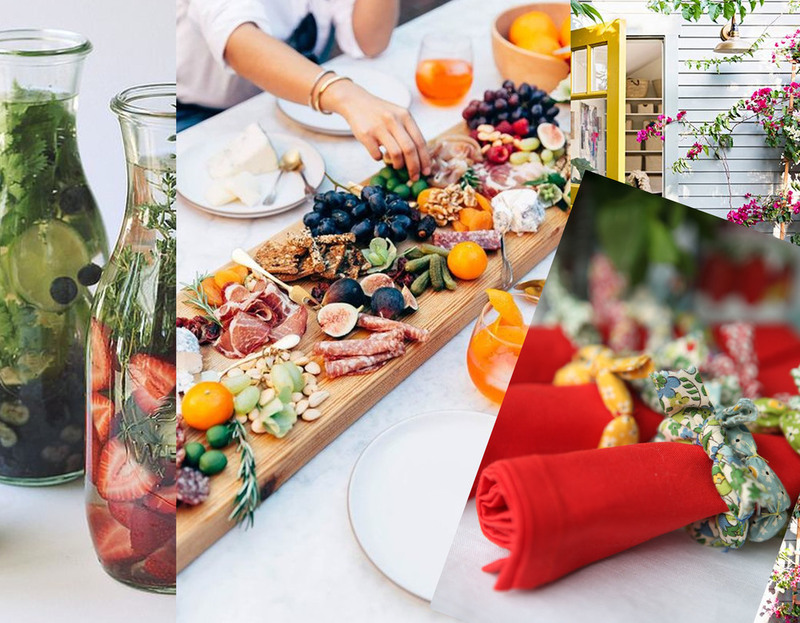 You will keep the party going with some easy entertaining ideas and lots of fresh drinks. Enjoy the great outdoors with comfortable furniture, welcoming spaces for lounging. Lightweight chairs are easy to move around as more people will join the conversation. Some will have the space to create a real summer kitchen, with refrigerated drawers, a small sink and a grill. The grill is usually fuelled by gas or charcoal and does not be part of the kitchen, a lot of free-standing option are available. Retro look, modern, coloured, metal, industrial look. 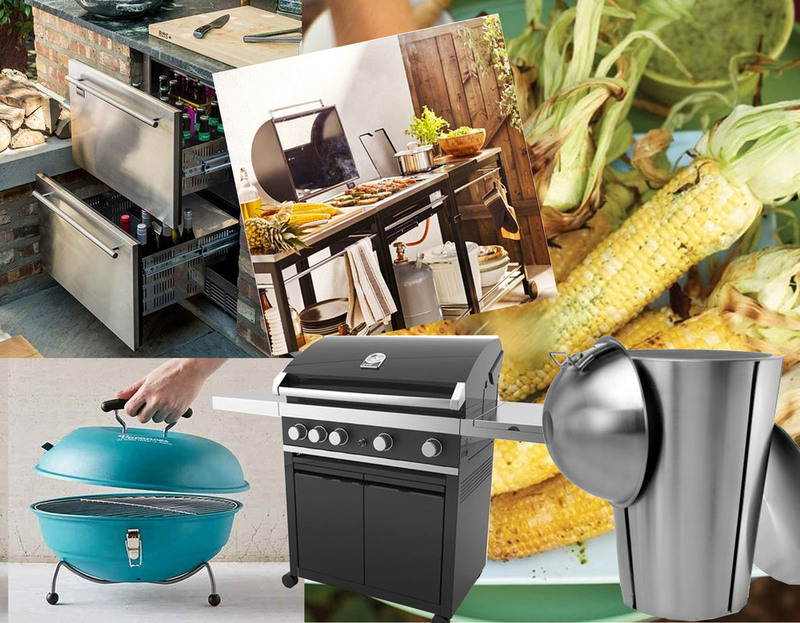 A grill can come in different sizes, to be able to prepare the food for a big group of people of just a small one, to take with you and to grill wherever you will be. I just discovered this compact minimalist grill and feel as having a barbecue on the beach. Think in the same way, as you would for a normal dinner, when organising a summer party. Decorate the space, and the table with attention for details. Use a lot of white candles as a quick and inexpensive way to transform the garden in a party-ready space. Hang lanterns from a large tree to create a feeling of stylish outdoor room. Small green plants as a center piece on the table. Leafy greens, watery blues will be the perfect base to make a tropical colour scheme. Outdoor entertaining comes with some challenges during the summer months: keep the bugs away with citronella candles. Cover appetizers with glass domes and cake stand covers to keep insect away and preserve the food's freshness. Let the sun inspire you to entertain well after the sun goes down. Have a great party! With a simple click on the Like button of my FB page you are sure not to miss one of my blog posts.